The place was absolutely great and met even exceeded our expectations. Rachel is proactive and incredibly helpful. The house was great. Nice house, totally aptly described, and the location is really lovely. We have already asked to rent the place for our stay next year! Rachel is a wonderful host. There was great communication throughout via email, and I love that she mailed the keys to the house with a prepaid envelope to mail them back. It shows that she's been very thoughtful about giving guests a great experience. The house is spacious and has everything we needed (including a great hot tub!). It's in a serene woody neighborhood and there's even a little creek running right by the back of the house. The kitchen is fully stocked, the house comes with towels, extra blankets, and even a closet of board games! Your house is amazing and very comfortable. It was really nice and cozy watching the snow fall all day and night on Saturday. It was a very mellow and relaxing weekend away from the city for us, which is exactly what we needed. Thanks again! What an amazing place! Highly recommended! We had a fantastic time at the Red Dog Cabin! It's a beautiful house with excellent amenities and very nicely put together. It has a wonderful view of the creek and surrounding woods through all the huge windows and a great kitchen for cooking and gathering in. Rachel is a great and accommodating host, we would definitely come back and probably will! The house was beautiful and clean, and we had a wonderful time. There are all the amenities to cook and entertain a decent sized group, and Rachel is delightful to work with. I will definitely look to stay there again! We thoroughly enjoyed our time at the Red Dog Cabin. It was easy to reach from the Bay Area and located conveniently in Tahoe (close to beautiful Echo Lake, a reasonable drive from attractions on the Western side of the lake, with access to groceries/restaurants etc just a 5-10m drive away but isolated enough that we felt we were really getting away). The house was clean, neat and well taken care of. We enjoyed the deck and jacuzzi, the nearby river, the ample rooms and modern bathrooms. Rachel was responsive at every stage of the experience and very detail oriented (clear instructions about how to get there, checklists for our arrival/departure, self-addressed envelope to send her back the keys, prompt return of the deposit $). We will definitely return. The cabin was absolutely beautiful, we all had the best time ever especially the poochies..the weather was fantastic, we strolled through the trails and also took a short drive to the lake.. And just had the best short weekend getaway.. We didn't want to go anywhere.. We just wanted to stay in the hot tub the whole time.. :).. Thank you again.. We will definitely try to stay at your cabin in the future. Everyone just loved it.. And didn't want to go home. Rachel, thank you very much, my family and I had a fantastic time at your place. It is an extremely nice house and am very pleased that you shared your vacation home with us. We thoroughly enjoyed staying in your house over the weekend. It's such a fine house! We'll definitely consider it for our next trip and also recommend it to others. We liked the decor a lot, and the pictures don't do it justice. We just got home a few hours ago and I just wanted to let you know what a wonderful time we had. Your home was absolutely perfect. We loved the surroundings and we took some incredible walks as you recommended. Your home is beautiful. Thank you so much for the blankets and the firewood and all of the other extras--like the saucers and the tobaggans for the kids. There wasn't anything we didn't have and we would love to stay here again if we could. The layout of your house is perfect. Your Tahoe house is wonderful. We all had alot of fun sledding in the backyard and we even got to see ducks in the stream. We all had a great time. Next time, if we are looking to go up, I will definitely check with you again. We had a wonderful time at the Red Dog Cabin...such a beautiful and well-appointed house, we were all very comfortable there (loved what you've done with the bathrooms) and the dogs had a blast romping through the snow as we walked up the road to the beginning of the trail. We got back from Tahoe this afternoon. We had great time staying there. Your house is very cozy and extremely neat and clean. I have to say your cleaning lady does a good job keeping the space. I walked with [dogs] every morning to the bridge. It is so peaceful there. Four friends from company staying with us the first three nights so we enjoyed cooking and playing games and reading comic books together after two ski days. It was a great break. This morning we woke up with white snow everywhere, it was so beautiful. (Dogs) ran crazily in the snow, they had such blast during the trip. Dear Rachel, We had an absolutely fantastic time! Your house is so comfortable and so conveniently located! We were able to cook fantastic meals and thoroughly relax during our two-night stay. We certainly hope to come stay again. it was a perfect vacation. Thank you so much for a great stay! We can't thank you enough for extending your beautiful house to us in South Lake Tahoe once again. We got about a foot of new snow overnight Friday and used your snowblower in the garage so we could back our car down the driveway! Thanks for having that available to us! We were very comfortable. My dog, Bailey, came with us for the first time and she had a fabulous time. Apparently, the snow doesn't bother her at all, even though she's very short hair. She loved it! Thank you so much. everybody had a nice vacation. Rachel, We really had a great time there. A lot of fun. Great snow. Snowed on Wednesday and sunny on Thursday. We were gone by 10:20 on Friday. I'll mail the keys today. Rented snowshoes and walked around. The Hope Valley was awesome. Really liked the river, would like to see that again in the spring sometime. Thanks! We had a super time (once again)! We got a day in skiing at Kirkwood on Tuesday. Not great coverage, but not the worst I've seen, either. It was a very cold day on Tuesday. At 6am your temp. gauge in the kitchen window read 0sF. WOW! Today was quite warm, however. The kids found a spot just to the side of the back porch to go sledding. A neighbor's chocolate lab came over to join us in the fun & played with my dog, Bailey. Thanks again for letting us into your house! We had a very comfortable stay. We had a lovely time in Tahoe, with all of the fresh snow, even though we had to wait a bit for the roads to open on Sunday! Thanks again, and your home was very homey. I'm sure it is equally as beautiful in the summer. Do you rent it out then as well? The trip was great--we had a wonderful time. Thank you so much for the house--it was perfect! It was really easy to find, even with all the snow, and it was in a great location with easy access to Kirkwood and to South Lake. The house is really spacious and everyone was really happy with the accommodations--we want to rent it again!! Maybe this winter! The fireplace(s) keep it really warm (it was 10 degrees on Sun. morning, but warm inside! ), and the living room was perfect for board games and watching football. Overall, we were really happy with everything. We love your house! It's not totally out of date or anything. If you stayed at other rentals in Tahoe, you'd know yours stacks up very well!! What I really love is that your kitchen is so well supplied. We go up with 3 other couples & we cook every dinner together. It is very comfortable and everybody who comes loves it. It's really great. the location is great: quiet and away from the hustle and bustle, with immediate access to trails; the house is very spacious and with all amenities in excellent condition -- I had a wonderful time there. House is at the end of the village, setting is private and within close proximity to beautiful hikes. South Lake Tahoe and a chain of small lakes are just a short drive away. This is a perfect place to relax and recharge! Every time I visit the cabin I leave feeling very relaxed. It is spacious, in wonderful condition, and nestled peacefully in the woods. Sustenance is also nearby in the form of some good local restaurants/bars and a grocery store. The hottub was a excellent addition, too! i love this place cause it is tuck away from the busy touristy area but still very convenient to get grocery or dine out. 20 min drive to kirkwood. we had peaceful walks/ hikes with doggies from the house. since it is end of a quiet street we could let doggies off leash. they ran into creek and field. i have never seen them so happy. the host rachel is the most responsible lady and very enthusiastic to share info (plus a dog lover). we stayed many times there before remodeling and had great time. i am sure now with new bath rooms/new decks and hot tub, it will be even better. indeed, we are going back soon. very excited!!! This is a beautiful place to stay for Lake Tahoe area vacations and Rachel is a great host!! We have stayed at Red Dog Cabin for no less than 10 times over the past several years and will be back often. The house is located toward the end of S Upper Truckee Rd in a quiet, secluded area facing a beautiful creek. While staying there, we've never felt being near the center of major tourist' attractions around the Tahoe area. On the contrary, once we settle down after our drive from the Bay Area, we only need to open the balcony door and step outside to feel close to nature -- the singing birds, the murmuring creek, and the rustling pine branches -- they are so wonderful. Better yet, our two Australian shepherds enjoy immensely running in the woods nearby, hopping in and out of the snow, and occasionally dive into the creek for a quick swim. There are quite a few trails, waterfalls, lakes, alpine and nordic ski areas within short walk or drive from the house. The several great super markets supply us everything we need to cook great meals at the house and to entertain with our friends and dogs. Rachel is a welcoming and warm host who loves the area, the house, our dogs and will be happy to provide information and assistance to get us around and enjoy our stay the most. If you are to have the opportunity to spend some time in the Tahoe area with friends and families, do not miss out the opportunity to stay at Red Dog Cabin. The house is spacious, well equipped, has wonderful views and is at the end of the road. Walks along the river from the house are very special and the river also runs right by the house. Strong recommendation! Every year, I plan a trip to Tahoe, and part of the pleasure of going is staying in this awesome house. Whether you ski or not, this house provides a welcome retreat. My friends and I use it as a place to relax, commune, cook good meals, go snow-shoeing, and hit the slopes! My winter wouldn't be the same without a trip to Red Dog Cabin! Red Dog Cabin is comfortable and easy to find. We had a great stay there in summer with two teenagers and found it to be a quiet retreat --yet still just a few minutes from essentials at Tahoe. We found an enchanting short hike just steps from the house through a series of rocks and boulders with a river running through it. Rachel put a lot of attention to detail into a recent remodel of the property -- new bathrooms, deck, mud room, and hot tub. Try it; you'll like it! We have stayed at the Red Dog Cabin both in the summer and the winter: both seasons are fantastic there. The house is right next to the National Forest, so you can walk right out the door for hiking, cross country skiing, etc. It doesn't get any better for nature lovers. Our dog loved morning walks including swims in the river, running in the fields, and exploring the forest. We've never seen her so content. Another huge benefit was that our young daughter who is too small to take on long hikes was exploring nature on short walks. It is the perfect vacation place for active families. The house is attractive, comfortable, and meticulously maintained. Another huge benefit is that the house is convenient to shopping and attractions. We've known the owners for years and they are great people: dependable, responsive, and really nice people. We had a short stay at Rachel's Red Dog Cabin in Christmas Valley, and had a great time. The place is ideal for medium-sized groups of 6-8. Everything was as advertised: the location is great (very accessible to Kirkwood and South Lake Tahoe), the amenities are in awesome condition. And Rachel is a very pleasant person to deal with! Definitely going back there again. 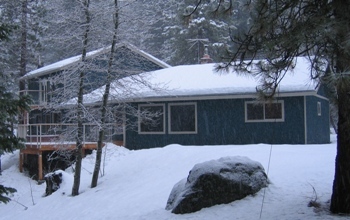 Our lovely house is located in a secluded neighborhood in beautiful South Lake Tahoe. The house is sunny and bright with large windows that allow you to feel that you are surrounded by nature. The Upper Truckee River runs through the backyard of this large 2-acre lot and the property is surrounded by National Forest. Located in scenic Christmas Valley, this house is away from tourist town traffic, but at the same time it is close to everything in town: shopping, entertaining, eating out, etc. and it�s just a 20 minute drive to the casinos or the southern shores of Lake Tahoe. This spacious and very comfortable house has 3 roomy bedrooms, 2 full newly remodeled bathrooms (done in bright colors in a contemporary style), a fully equipped kitchen with the dining area, a living room with a fireplace, and a large mudroom. The deck overlooks the river, and again, provides you with a great mountain view. On the deck you will find a hot tub for you to appreciate at the end of a joyful day and a gas grill to cook with your family and friends. We have set up the house as our home and we love coming here! We know you will enjoy the art on the walls, the furnishing, and the comfortable bedding. And we can assure you that every visited dog believes our place to be the ultimate dog paradise. Whether it's winter or summer come and enjoy your perfect vacation in Tahoe.